Rent Human Whack A Mole 7 player interactive version of the popular arcade game. Human Whack A Mole - A lifesize, interactive inflatable version of the popular arcade game., 6 players ("moles") try to pop up and gather balls from the middle apron, while 1 person stands in the middle and "whacks" the moles with a soft hammer, to deter them from popping up and getting hit. The mole wih the most balls at the end of the game, wins!. 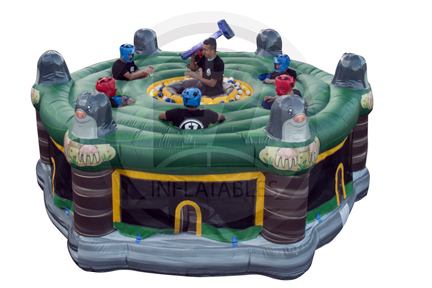 Includes: Inflatable, blower, and 1 attendant.